Expanding its collection of Verdi’s rarities, which already makes boast of Attila and La forza del destino, in 2017 the Mariinsky Theatre has put on I vespri siciliani. 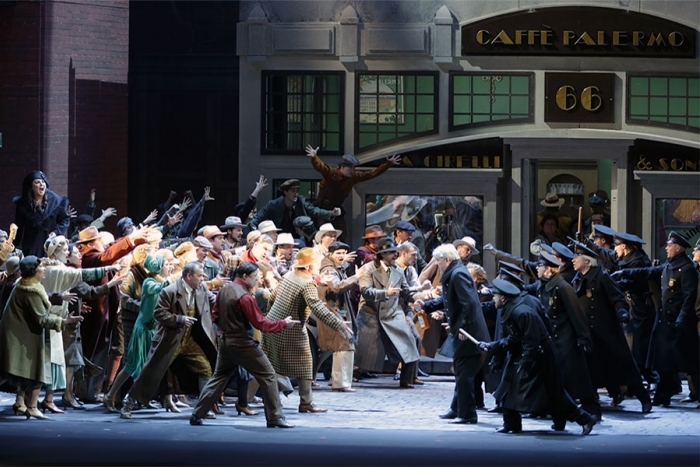 This masterpiece of the once-popular French grand opera genre, with its characteristic vividness of historic background and an obligatory ballet divertissement in the third act of the standard five, is not a common title for any opera house of the world. 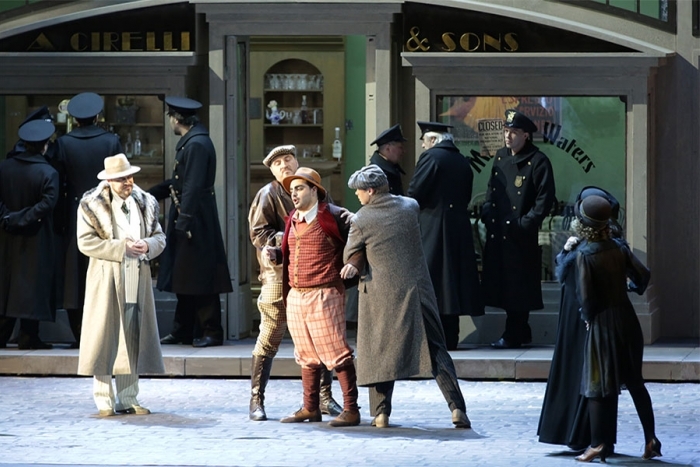 The staging by Arnaud Bernard transposes the setting from the 13th century Sicily to New York of the 1920s – an era glorified by such films as Godfather and Once upon a Time in America. The medieval Sicilians’ guerilla against the French invaders transforms seamlessly into the Italian immigrants’ struggle for the chance to live their American dream. The land of equal opportunity would not welcome its new citizens with open arms: New York Police Department is so corrupt that the Sicilians are forced to violate the laws of their new homeland. Venal police commissioner Monforte, his unscrupulous mafioso archenemy Procida, zealous vengeance-driven Elena and lovesick maximalist Arrigo – in this production everyone wears their true colours. 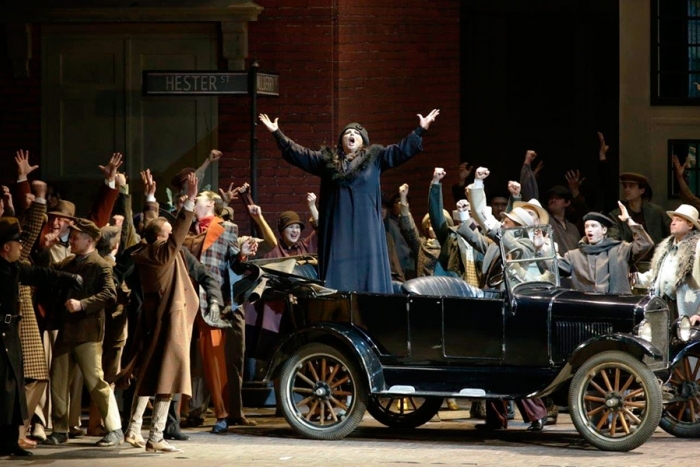 But listening reveals other dimensions: Verdi found warm intonations for each character and displayed each personality in multiple aspects – the antagonist Monforte suddenly appears a tender father in his soliloquy; Elena abandons her longing for vendetta as she sings her sparkling, sun-soaked bolero. The composer brought in some vocal challenges as well: Arrigo’s aria is mercilessly put in the fourth act, requiring all the stamina a tenor might have; and Procida’s is one the most extensive bass parts in any opera, so no wonder that it was Ildar Abdrazakov himself who suggested that Valery Gergiev should have added I vespri siciliani to the playbill. Abdrazakov performed this part in the Teatro Regio in Turin during the celebrations of the 150th anniversary of Italian independence. 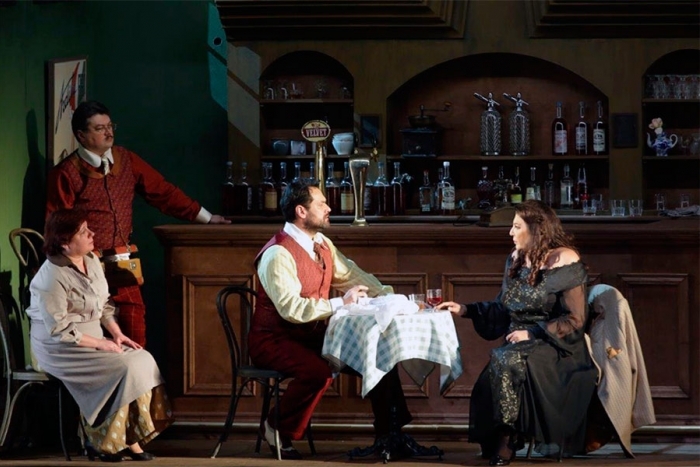 The rest of the cast learnt the unfamiliar score with passion, and the premiere run saw the brilliant performances by Irina Churilova, Migran Agadzhanyan, Vladislav Sulimsky, Kirill Zharovin and Stanislav Trofimov. Immigrants’ district of New York, 1920s. The police are trying to stop smuggling and bootlegging that the Sicilian mafia lives on. During one of their raids Elena, a young Italian girl, loses her brother. The police are raiding the Sicilian corner of the city. The locals are hostile. Having the upper hand, the policemen are abusing the Italians. Elena is mourning her brother Federico and blames the police commissioner Monforte for his death. The policemen harass the girl, they want her to sing for them. Her song inspires the Sicilians to fend the intruders off, but their courage only lasts until Monforte appears. Arrigo, a friend of Federico, shares Elena’s hate and craving for revenge. He is not afraid to say it in his opponent’s face. Arrigo’s bravery and zest appeal to Monforte. He asks the young man about his family and invites him to join the police. Arrigo refuses. Giovanni da Procida, a mafia boss, is released from prison. He shares his plan for vendetta with Arrigo and Elena. His aim is to set all the Sicilians against the police. The feast of Saint Roch offers the best opportunity for this. Arrigo confesses his love for Elena. She agrees to marry him if he avenges her brother’s death. A police officer brings Arrigo a message that summons him to Monforte. The young man would not go, so the police lead him away by force. The feast of Saint Roch. A solemn procession is going down the street. Procida incites Monforte’s men to abduct the pretty Sicilian women, and they go for it. The patience of the Sicilians is exhausted, they are ready to act. Monforte has received a letter which says that Arrigo is his son. The commissioner is full of hope: his lonely years are over, he has a family now. Arrigo is taken aback by the respect he is treated with at Monforte’s. He is shocked to find out that his mortal enemy is his own father. Arrigo runs away refusing to admit their family ties. Elena and Procida meet Arrigo at a cabaret and let him in their conspiracy: a massacre is about to take place here, and Monforte is the main target. The conspirators wear a ribbon of silk. Arrigo tries to warn Monforte, and when the slaughter starts he shields his father from the blow. The conspirators are arrested. They anathematize the traitor. Racked by remorse, Arrigo visits Elena in prison. He explains that he had to save his father’s life and that now his filial duty is paid. Procida is excited by the news of the allies coming to aid the Sicilians. The commissioner orders to begin the execution, but Arrigo begs him to grant his friends a pardon. Monforte’s condition is to be accepted by Arrigo as his father. The prisoners are preparing to die, a penitential prayer is sung. Arrigo surrenders and calls Monforte father. The execution is stopped. Monforte grants his pardon to the conspirators and blesses the match between Arrigo and Elena. Elena and Arrigo’s wedding is being prepared. The couple is dreaming of a happy and peaceful future. But when Arrigo has to go, Procida reveals his new plan to Elena: the wedding bells will be the signal for slaughter. Elena is dismayed. She decides to forfeit the wedding so that the bells would not have to ring at all. But Monforte defies Elena’s protestations and joins the couple’s hands. Procida commands to ring the bells. This show has no active performances now!